Celebrate your loved ones and memories with this elegant ring. Sparkling oval stones share prongs on this instant family heirloom. Stone details: 4 - 5x3mm oval; 1 - 6x4mm oval center stone for Mom. 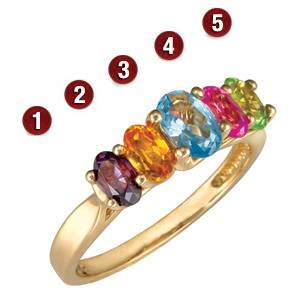 Available in white or yellow, 10k or 14k gold, with simulated or genuine birthstones.